Synopsis: Lysistrata (or "Army-disbander") is one of the few surviving plays written by Aristophanes. Originally performed in classical Athens in 411 BCE, it is a comic account of one woman's extraordinary mission to end The Peloponnesian War. 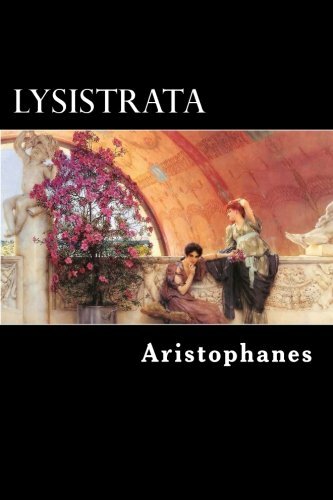 Lysistrata persuades the women of Greece to withhold sexual privileges from their husbands and lovers as a means of forcing the men to negotiate peace — a strategy, however, that inflames the battle between the sexes. The play is notable for being an early exposé of sexual relations in a male-dominated society. The dramatic structure represents a shift away from the conventions of Old Comedy, a trend typical of the author's career. It was produced in the same year as Thesmophoriazusae, another play with a focus on gender-based issues, just two years after Athens' catastrophic defeat in the Sicilian Expedition. Aristophanes (circa 446 BC – 386 BC), son of Philippus, of the deme Cydathenaus, was a comic playwright of ancient Athens. Eleven of his 40 plays survive virtually complete. These, together with fragments of some of his other plays, provide the only real examples of a genre of comic drama known as Old Comedy, and they are used to define the genre. Also known as the Father of Comedy and the Prince of Ancient Comedy, Aristophanes has been said to recreate the life of ancient Athens more convincingly than any other author. About the Author&colon; Peter Meineck is Clinical Associate Professor of Classics, New York University, and Artistic Director of the Aquila Theatre Company.